Welcome to experience exclusive sunrise and sunset concerts with Elisabeth Vatn and Anders Røine in James Turrell’s light installations in Ekeberg sculpture park. The Color Beneath by musician and composer ELISABETH VATN was conceived in James Turrell’s light installations in the old water reservoir at Ekeberg sculpture park. Between 10–13 September, Vatn (harmonium, Meråker clarinet, bagpipes) performs with ANDERS RØINE (Norwegian dulcimer, langeleik, jew’sharp, violin). Contemporary artist JAMES TURRELL works with perception, colour, light and space. The two location-specific works Ganzfeld: Double Vision and Skyspace: The Color Beneath were both created for the old water reservoir in 2013. 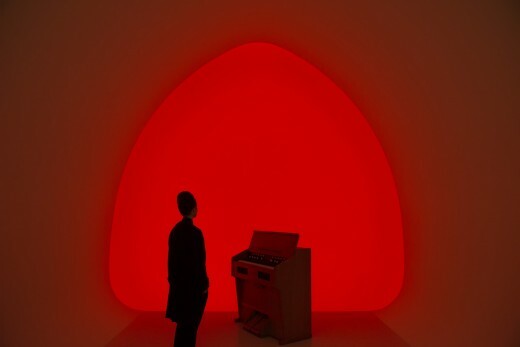 While Ganzfeld explores the way colours affect our senses, Skyspace makes use of the chromatic interaction between the concert space and the sky at dawn and dusk. In The Color Beneath the composer and performer turn their encounter with the installation into music, partly following the composition and partly through improvisation. Consequently, none of the concerts performed in this unique setting will be identical. The Color Beneath album was recorded during autumn 2014 and is released during Ultima 2015. The concerts are staged in cooperation with nyMusikk, Ekebergparken and Grappa Musikkforlag with contributions by Fond for Utøvende Kunstnere. ← What a great night! Chateau Neuf Spelemannslag – CNS!